One of our favorite places to visit in Atlanta is the High Museum of Art... or as the Atlanta residents call it "The High." Aside from their fabulous permanent collection and featured exhibitions, they offer amazing programs for all ages. Today, we rounded up the troops and took them to the High for "Toddler Thursday" to stroll through the Dream Cars exhibit and make their own art. Even before we purchased our admission tickets, we had the opportunity to relax and enjoy the new art installation on the Sifly Piazza. 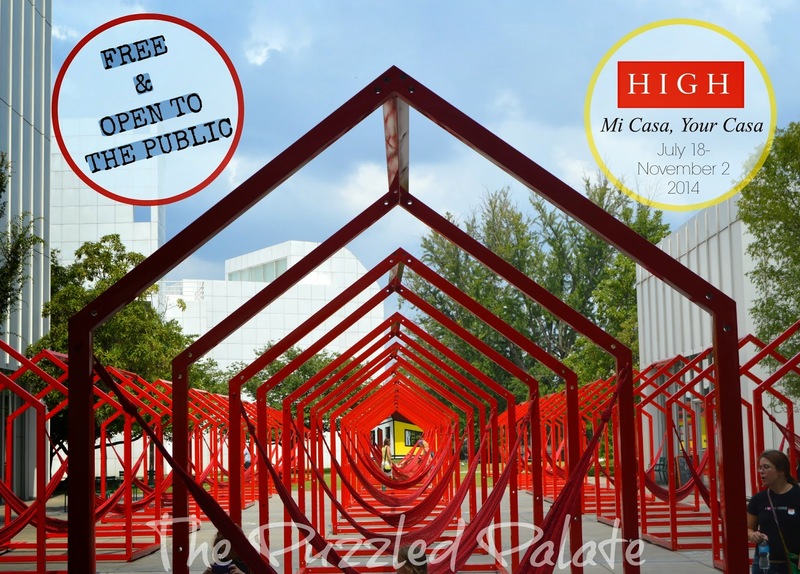 Located in the middle of the Woodruff Arts Center campus, the Mi Casa, Your Casa interactive setting is open to the public for no charge! 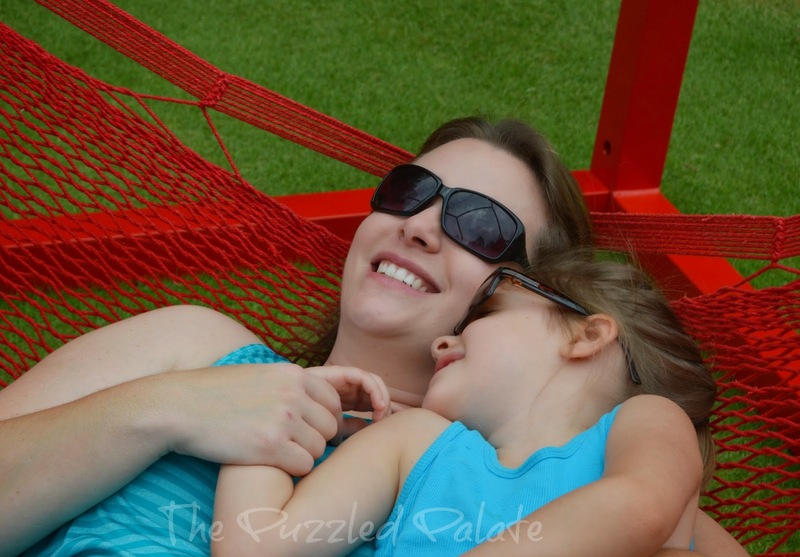 If you follow The Puzzled Palate on Instagram, I am sure you noticed that I was blowing up the feed with fun pictures from our time on the hammocks and tagging them with #MiCasaYourCasa. Aside from the fact that I am an unapologetic shutterbug, there was another reason for the onslaught of pictures. While you are relaxing and inevitably updating your social media buddies, your photos will print out at the Smilebooth located right inside the front door of the museum. The photos are 100% free and actually print attached to a coupon for a discounted admission! Look at my new refrigerator art! Here are some favorites shots taken with the "fancy" camera! Just relaxing with my girl! M with her fabulous aunt "TT"- all snuggled up. Cheesin' it up with my mom... selfie style! My mom's first official day of retirement! Mom- THIS is the life! My buddy, Miss Banana taking a break from chasing Peanut! The sweetest little guy- I love my BFF's kiddos! M's best buddy, T- all tangled up and loving it! 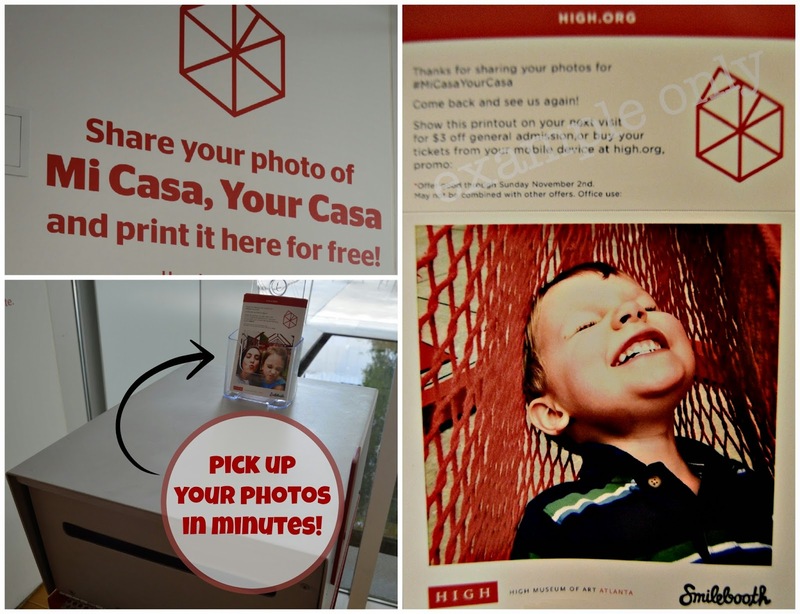 The Mi Casa, Your Casa interactive exhibit will be open until November 2nd, 2014! Grab a friend, a good book, a bag lunch and head over for some free fun! Visit the High Museum of Art's website. 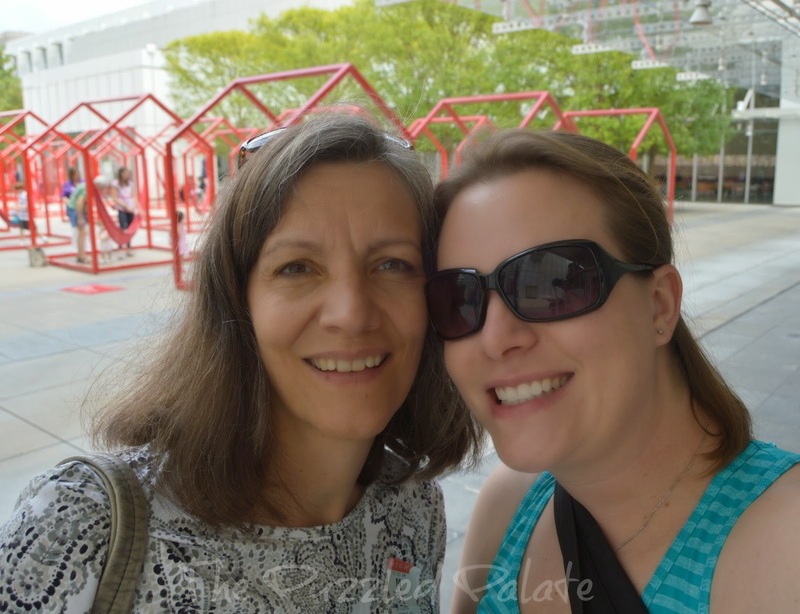 Have you ever been to the High Museum of Art? No way! My two would have a field day there. I can totally see why you guys love to go there. I think I have been by the High, but not actually visited. It looks fun! I had no idea this was there! That's awesome. And the pictures print, too? Wow! What a great place, and even better for those fun photos! You guys know how to have fun! I would love this museum - I am a real fan of unique art! That is super cool -- I would love to go with my kiddos if we lived closer. Great photos! I go to Atlanta several times a year, but have never been there. We'll have to take the kids sometime. Looks like fun! My kids love playing with sidewalk chalk. Can't wait to hear about the threapy sessions! What a fun place to visit! I love all your pictures! I've never been, but would love to go if I ever find myself in Atlanta. I could see myself not wanting to ever get out of those hammocks. What a neat installation. Love all the photos. Awesome photos! Looks like good memories were had! Sounds like a wonderful place to vaca with the kids. oh wow how fun. That looks like a great time for the whole family! Looks like a whole lot of fun.Your pictures are great and I like the fact that they print them and give you admission discount when you share. I have been kind of dying to go see Atlanta. This is definitely on my list if I ever make it there. That looks like so much fun! I'm sure my family would totally enjoy that! HA! That looks like a fun time. My favorite place to relax is my back yard. Such great pictures! Looks like a fun place to spend the day! What an amazing museum! I would love to visit someday. No I have never ever been. I haven;t taken my kids to Atlanta yet and have only ever been there for a conference. This looks awesome and my kids love museums so I would definitely try this place if I take my family. Love the hammocks! 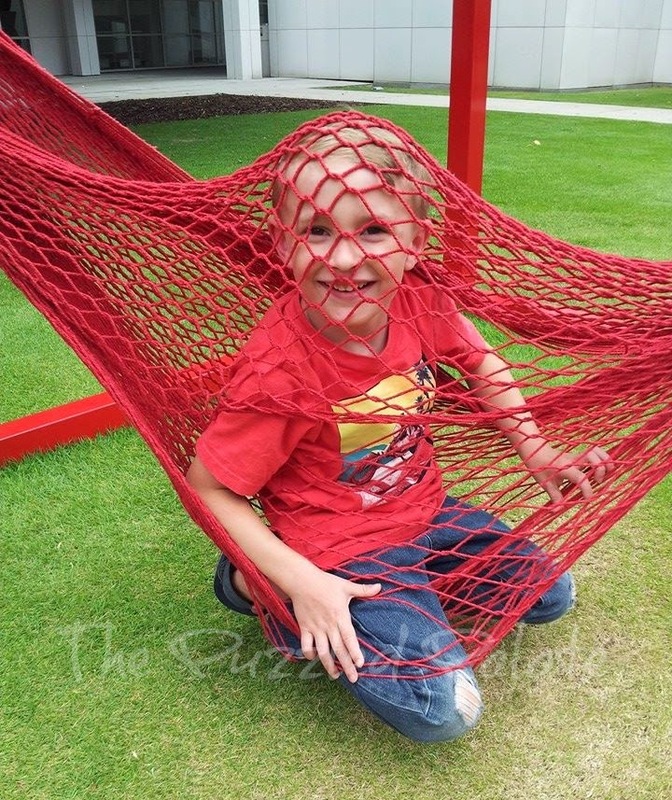 Those red hammocks look like fun. Congrats to your mom for enjoying her first full day of retirement. 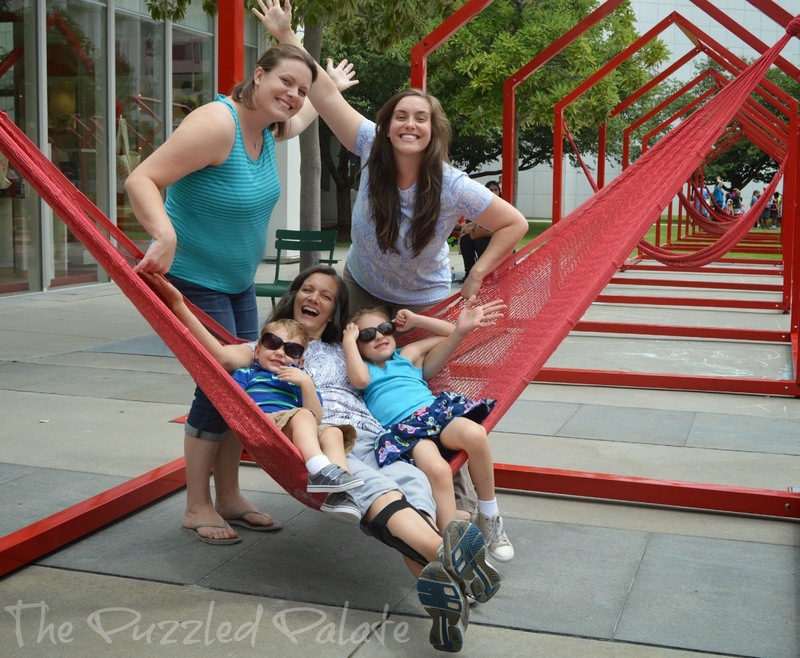 I have not visited Atlanta is the High Museum of Art but it looks like fun. I've never been but your pictures look wonderful! A happy family. :) When it comes to relaxation, I go up north and take in the scenic and quiet wonders of the mountainous green area. Looks like such a blast! How neat that they'll print those photos for you right there! my girl loves sidewalk chalk. It's so much fun to play hopscotch with her. Skills are always important. That looks like lots of fun. It is definitely my kind of place. That's a great way to usher in the first official day of retirement. 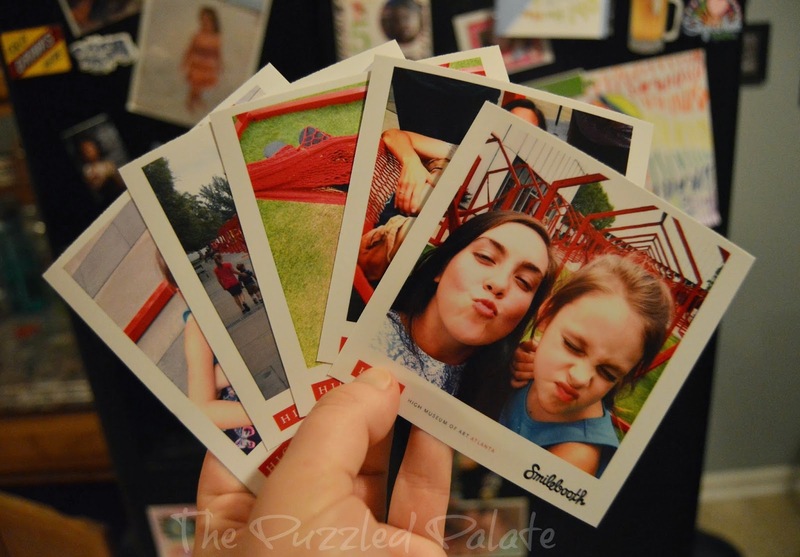 :) I love that you can print your photos free! We just came home from the High Museum, we had a FANTASTIC time. The hammocks were irresistible, none of my family could stay our of them. The Dream Car exhibit was what brought us to the museum but we loved all the art. We took advantage of Free Fulton Saturdays. Those photos are so cute. What a great time to be had by all. We have quite a few art museums around us. Many are low cost and/or offer a free day once a week. Looks to be a fun exhibit! Never heard of anything like this at all! From looking at the pictures you all seem to have enjoyed yourselves! Looks like you have a lot of fun when you visit there. I wish I had known about it when we lived closer I would have loved to go there. That looks like a super fun museum! 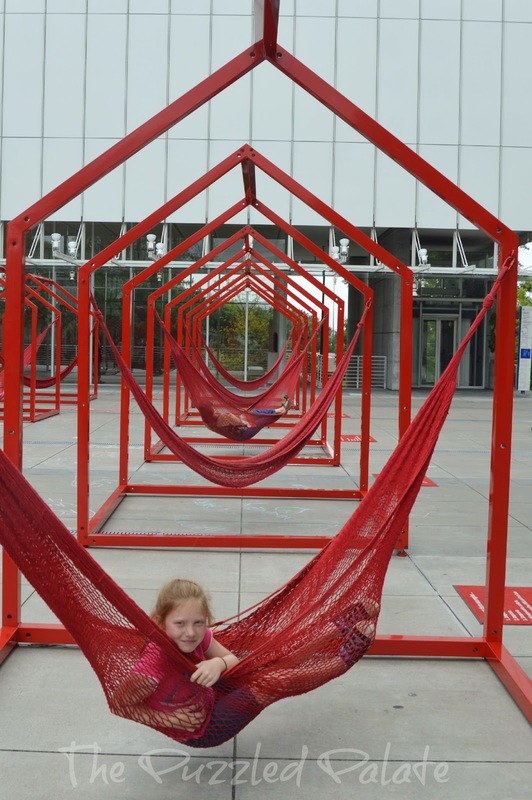 My kids would really get a kick out of the hammocks. Congrats on your mom's retirement! 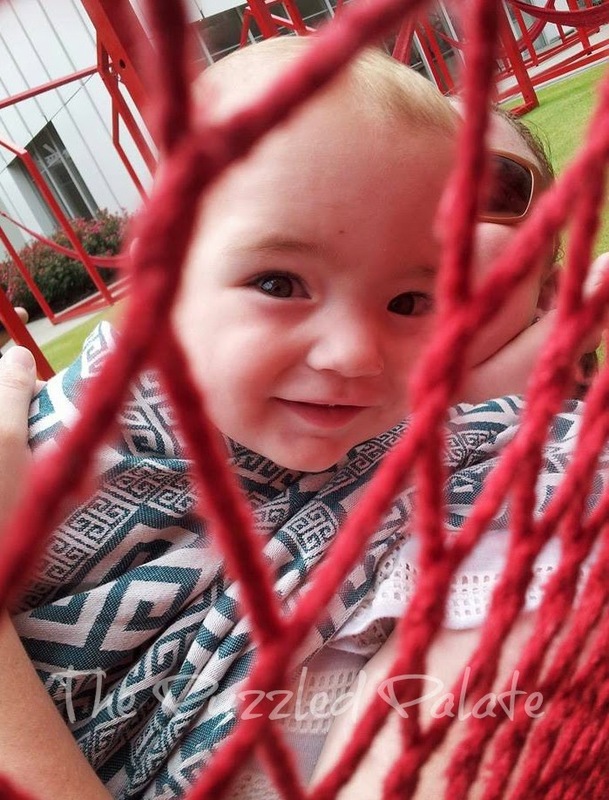 What adorable pictures with you and your little one. I would love to take my boys to this if I am ever in Atlanta. Great pictures! This looks like a fun place to visit. Thanks for sharing. I really need to pick up some more sidewalk chalk. The boys really love it and it keeps them entertained for hours. Those hammocks look so cozy! What a great afternoon! I have never seen anything like that before. That looks like it would be so much fun for an afternoon with the family. I love your pictures. I have never been to this museum but it looks like a great place to visit. My favorite place to relax is in my front yard with a cool drink. This looks like such a fun place to visit. The fact that you can take pictures and get free photographs is an added bonus. Wish we had this some where closer to us. This is fantastic. 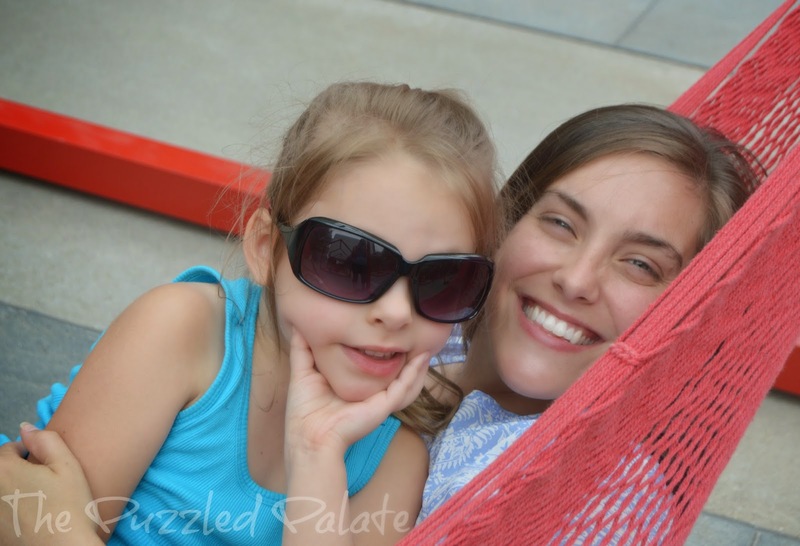 I love your "unapologetic shutterbug" line, too! That looks likea a great place. So much fun and interaction. The red is so vibrant. That alone is like art and fun in one! Nice find. I will be visiting Atlanta soon. I am going to have to check this place out. I haven't been here. Bet my kids would love it! That is so cool! Next time we go to Atlanta we're so stoping by that! I remember when my kids all played with sidewalk chalk, it really is a good way to develop different motor skills. Relaxing at home is fine for me - but going to a museum of art seems really fun, too! My kids play with sidewalk chalk all the time. It is great. The kids are only limited by imagination. that place looks awesome! I will be a couple of hours away from Atlanta in November...I may have to take a day trip to check this place out! That place looks awesome! Love your pictures! I love sidewalk chalk and so do our kids! Sounds like they have a great time with it. What a fun activity. I love keeping the children busy with activities that improves skills!